With Mitsubishi Electric Cooling & Heating you'll discover comfort without compromise. Beyond simply regulating the temperature within your space, individual room controls allow you to improve the efficiency of your entire Redding home. 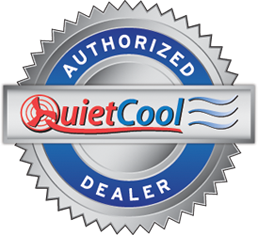 Ductless mini split air conditioners have numerous potential applications and advantages. They are perfect for both home and business applications. These air conditioners are more efficient and easier to maintain than room air conditioners and PTAC's (Packaged Terminal Air Conditioner). They are available in floor mounted, wall mounted, ceiling cassettes, ceiling suspended and in single zone, and multi zone units covering up to 8 rooms. This gives you the ability to only run the air conditioner in areas being occupied and keep different comfort levels in different rooms. Every building and every situation presents it's own problems with climate control. Architects and engineers have realized this for years, of course, and they have struggled to adapt air-conditioning technology to modern living and working demands. Ductless systems now make the job much easier. 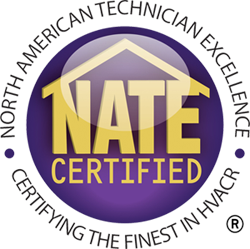 Going ductless can mean changing indoor climates from variable and unpredictable to cool and consistent, without expensive renovation work or compromising the structures integrity. And the work can often be done by a professional in a matter of hours. 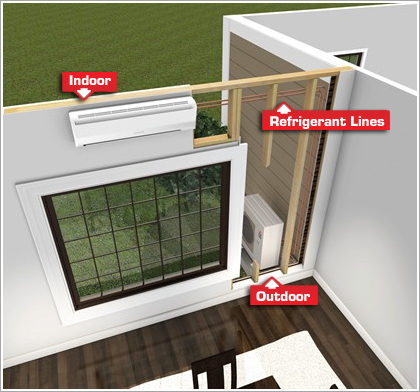 With a ductless system, simple copper tubing and electrical wiring to indoor units connects a separately installed outdoor unit. Refrigerant is pumped from the outdoor condenser coil and compressor through the tubing to the indoor unit or units. A fan then quietly distributes cool air drawn across the unit's evaporator coil. The amount of cold air entering the room is regulated by an remote control - thermostat. If multiple zones (air handlers) are being utilized, one room - area of a building can maintain a different temperature from another area in the same building thereby satisfying endless comfort levels. In a central air conditioning system, refrigerant is also pumped from the outdoor condenser coil indoors to a single indoor coil from which cooled air is distributed to each room through a system of ducts. In many houses and businesses, the amount of cold air in one room cannot be regulated without changing the temperature of every room in the building.